Part of a growing movement thinking differently about how to support people living in conflict areas, Refugee Open Ware (ROW3D) works to provide the tools, training and skills to teach people how to digitally fabricate the things they need. Around 1.5 billion people live in conflict areas globally, and more than 51 million people are forcibly displaced by war every year. The instability of these regions mean that essential materials and supplies frequently can’t get through. Among the many urgent needs, healthcare equipment is a priority. Refugee Open Ware uses digital fabrication techniques to make some of what is needed locally and as a result alleviate some of the problems, saving lives in some of the worst areas of conflict around the world. 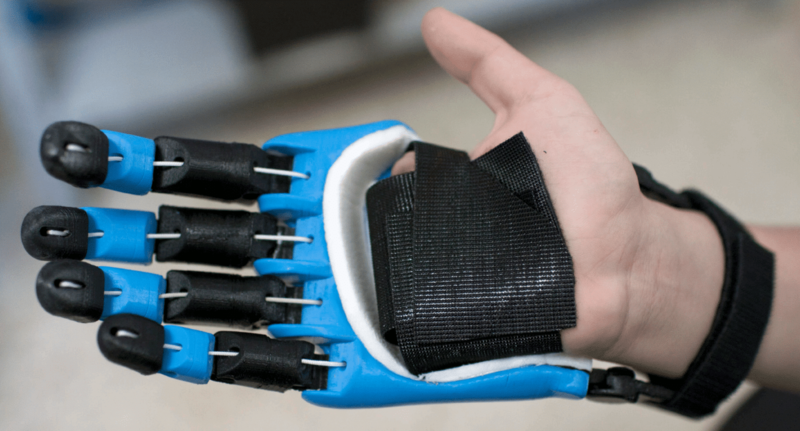 Currently making healthcare equipment and rescue devices, in the future the project plans to provide custom-made prosthetics specifically to people living in refugee camps. Long-term the benefit of these new skills and workspaces in these areas could reshape traditional methods of manufacturing, and with it entire economies. A boy or girl who has grown up in a conflict region could be equipped with the skills and knowledge that can help rebuild their community and create new industries and jobs, for a whole generation. Led by ROW3D Printing Technician Asem Hasna, a Syrian refugee teaching Arduino programming and DIY robotics to both refugees and Germans in Berlin, the first Fab Lab and micro-factory for advanced manufacturing in a refugee camp is being envisioned. The lab will support refugees to become more self-sufficient through cutting-edge vocational training, free repair services for the community, R&D on basic goods, entrepreneurship, psychosocial support through interactive art, informal STEM education and co-working spaces. project_image_description_1 Photograph: Za'atari refugee camp, Jordan. Tags: 3D printing, Digital fabrication, Economy, Employment, Medicine, Peace building, Refugees, Wearable technology.